Vintage - Kutani Eggshell Porcelain, Omachaya Hand Painted Tea Set of Mt. Fuji and a Pagoda, Made in the 1950's, 17-pieces Set. 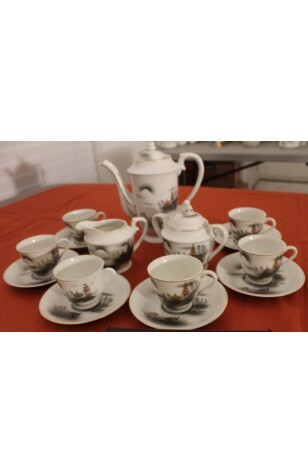 A greatly delicate Kutani, Eggshell Porcelain, Omachaya Hand Painted Tea Set, Service for Six. This set is a White China with Red Enamel, and 22kt Gold Pagoda and House, over Gray Shadowing, with Mt. Fuji in the Background. There seems to be men (in 22kt Gold) carrying heavy burdens on their Backs in the foreground. A very Fragile and Quite Lovely Set with the Red Enamel and 22kt Gold Gilt. In great condition. A greatly delicate Kutani, Eggshell Porcelain, Omachaya Hand Painted Tea Set, Service for Six. This set is a White China with Red Enamel, and 22kt Gold Pagoda and House, over Gray Shadowing, with Mt. Fuji in the Background. There seems to be men (in 22kt Gold) carrying heavy burdens on their Backs in the foreground. A very Fragile and Quite Lovely Set with the Red Enamel and 22kt Gold Gilt. In Great Resale Condition unless noted below or in pictures. 6 - Saucers - 4 3/4"